We're one professional manufacturer which refitting special truck and trailer in China, established in 1969, more than 40 yrs producing experience, a growing enterprise with endless innovations and development. Our corporation mainly specializes in the various semi trailers and special vehicle related business, such as dump truck, tanker trailer, concrete mixer truck, and etc. Also, our business line ranges from the research, development, and design to the manufacture and sales for other automobile accessories, especially for axles and hydraulic cylinders. We're one of the earliest company to get the approval of the ISO, CCC and Compulsory Product Certification Enterprises. We have exported more than 30 countries from 2005.Looking forward to your visiting or calling. We keep good relations with main truck manufactrers in China. 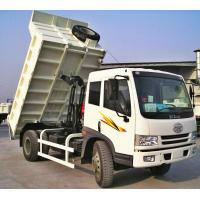 And we can supply all brands dump truck made in China. HOWO, SHACMAN, BEIBEN, DONGFENG, SINOTRUK, BEIBEN, FOTON, C&C, and so on. More details for these trucks, feel free to contact us please.